Much media attention has been focused on the sudden spate of deadly hurricanes that struck the US, but a slightly broader perspective yields a truly terrifying picture of natural disasters of Biblical proportions all across the globe. The disasters are arriving faster and with more intensity than in years past. From 1980 until 2012, there were an average of 5.5 natural disasters in the US annually responsible for a minimum of $1 billion of damage, according to the National Oceanic and Atmospheric Administration. Suddenly in 2012, the annual average for these disasters jumped to 10.6 events. With 10 disasters of this magnitude already, this year is poised to surpass that. In fact, much of the year’s damage has come only in the past few weeks and is still happening. Though there is no cause-effect relationship between the total solar eclipse and the events listed below, all of the catastrophes have occurred since the eclipse traversed the continental US on August 21. While many of them, like Hurricanes Harvey and Irma, have been widely covered in the media, dozens of other disasters have quietly struck throughout America and the world during the same period with less fanfare, but equal devastation. 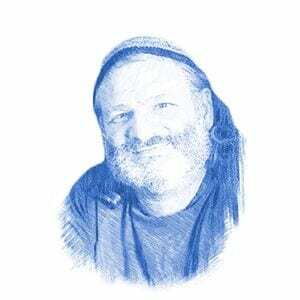 Breaking Israel News has compiled a list of the worst disasters, from most recent to least. 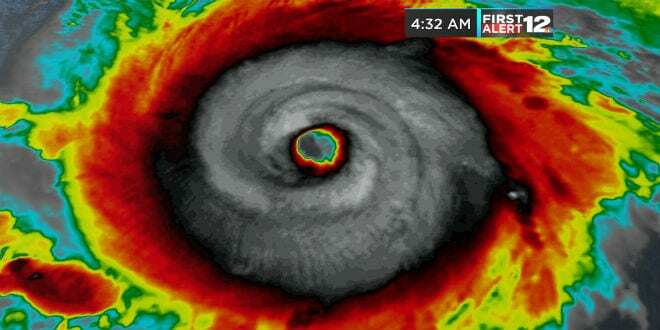 While still developing over the Atlantic Ocean, Irma was classified a category five hurricane and the most powerful storm ever recorded over the Atlantic with recorded sustained winds of over 190 MPH. Irma hit the Caribbean last Wednesday, damaging up to 90 percent of the buildings on some islands and at least 24 deaths were reported. Glancing off of Cuba, the storm hit Puerto Rico hard, leaving over one million people without power. Florida is currently suffering the fury of the storm, which has been downgraded to a Category 1 hurricane. 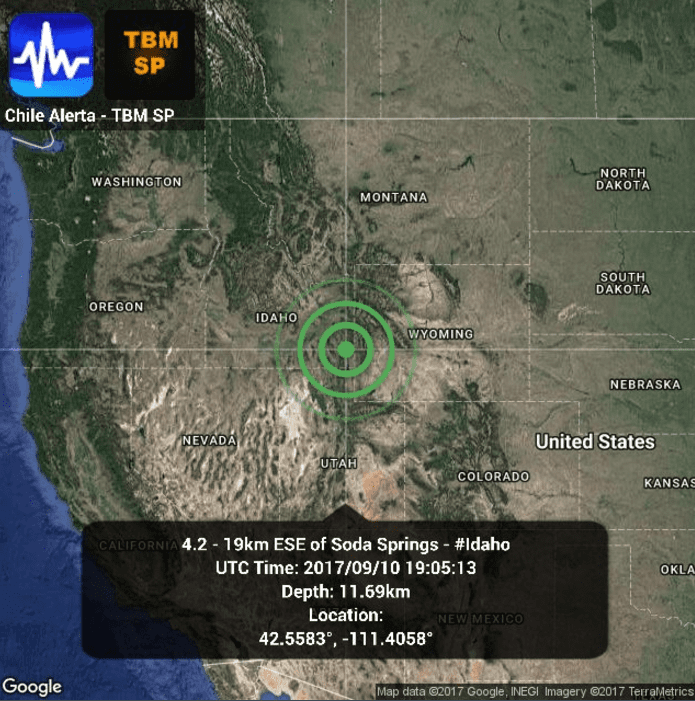 Over 140 earthquakes have shaken southeast Idaho since Saturday evening. The most powerful tremor in the swarm was the second quake to occur, a 5.3 magnitude earthquake. Earthquakes are very rare in the region. Katia hit the Mexico from the East less than one day after the earthquake struck from the West, killing two more people in a mudslide. Katia is the eleventh Atlantic storm to be named so far this year. An average Atlantic hurricane season – which runs from June 1 to November 30 – produces 12 named storms, of which six become hurricanes and three major hurricanes. 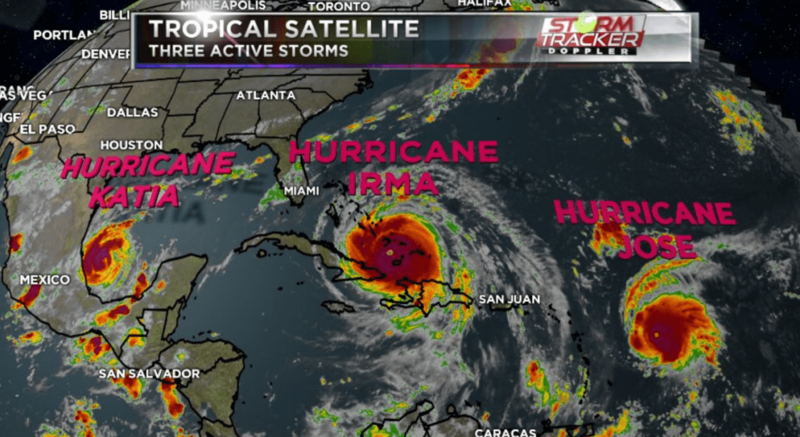 Forecasters said last month the Atlantic hurricane season would be “above-normal,” with 14 to 19 named storms ahead of the peak season. 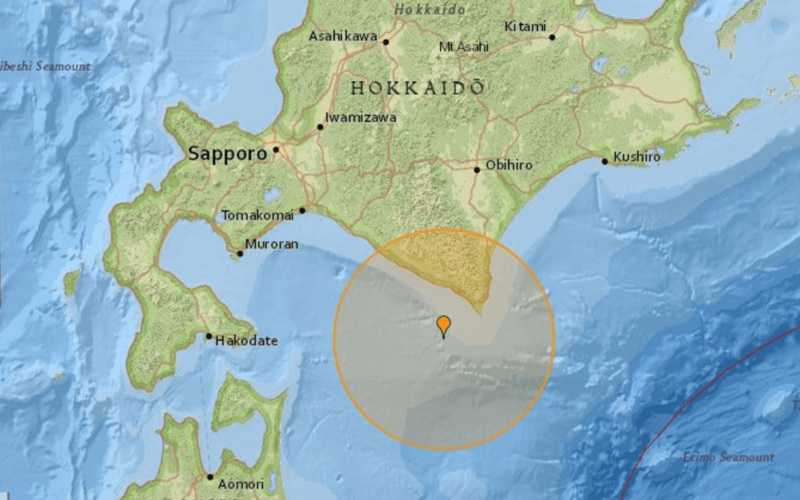 Just a few hours after the earthquake in Mexico, a 5.3 Richter quake shook Akita prefecture in Japan. 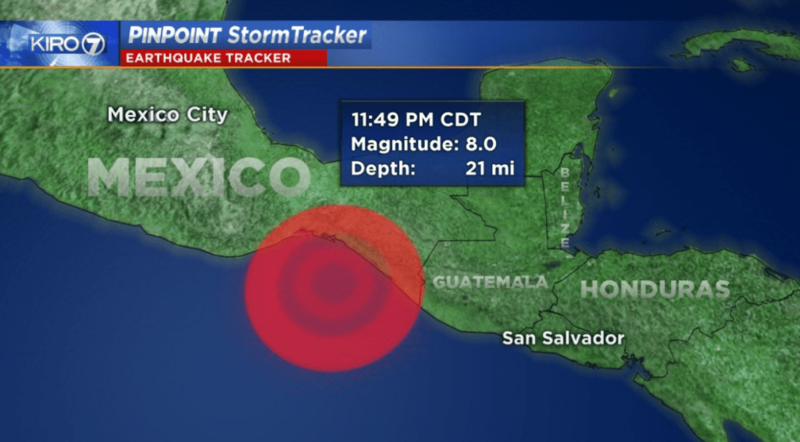 Just after midnight, the strongest earthquake in over a century, measuring 8.4 on the Richter Scale, hit Mexico, killing at least 90. Starting off the Pacific Coast, the quake also generated a small tsunami. The sun has shown an unusual amount of activity in the past week, producing at least six solar flares since Monday from one massive sunspot, including the largest flare recorded in over a decade. 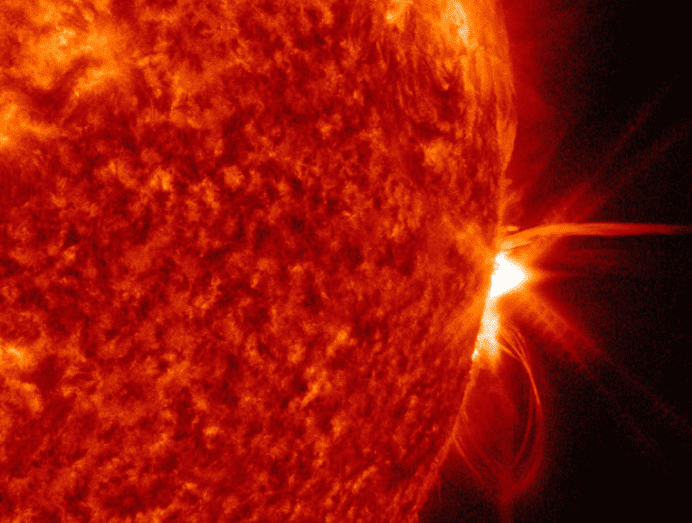 Though not dangerous, solar flares can disrupt the electronics on satellites and, in extreme cases, on Earth as well. The flares are unusual and space weather scientists state that they had not expected this much activity from the sun at this point in its 11-year solar flare cycle. 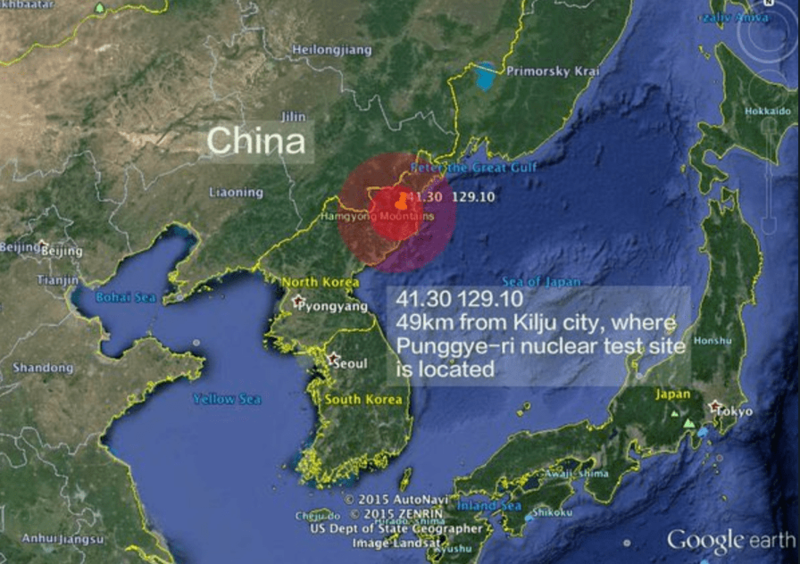 Though man-made, the 6.3 Richter earthquake in North Korea might have been the most globally threatening earthquake ever. The tremor was generated by an underground detonation of a hydrogen bomb that the US and other nations saw as an act of antagonism in an already volatile situation. An already deadly monsoon season finished up with an unexpected second wave of heavy rainfall that flooded Mumbai and killed over 400 people in India. Hundreds of thousands were left homeless and thousands of acres of farmland were destroyed. Over 1,200 deaths in southeast Asia were attributed to the unusually heavy monsoons. 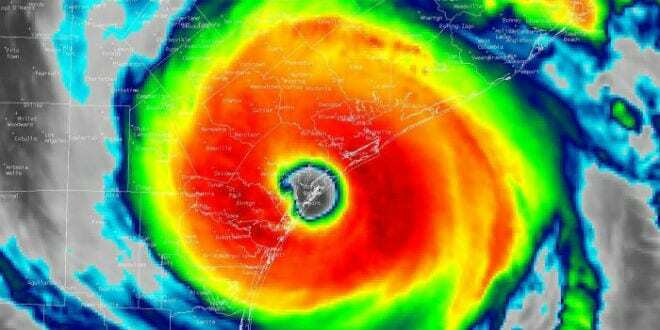 The Category 4 hurricane hit the Texas Gulf Coast just four days after the eclipse. It ended a 12-year period in which no such hurricanes made landfall in that region. The wettest tropical storm to hit the continental US, it dumped 51.88 inches of rain on eastern Texas. Massive flooding made Harvey the costliest natural disaster in US history, with economic losses estimated at $190 billion. At least 70 Americans died in Hurricane Harvey. Yellowstone Swarm Continues: Yellowstone Caldera is the site of one of the largest earthquake swarm ever recorded in the world, with 2,357 quakes registered since June. 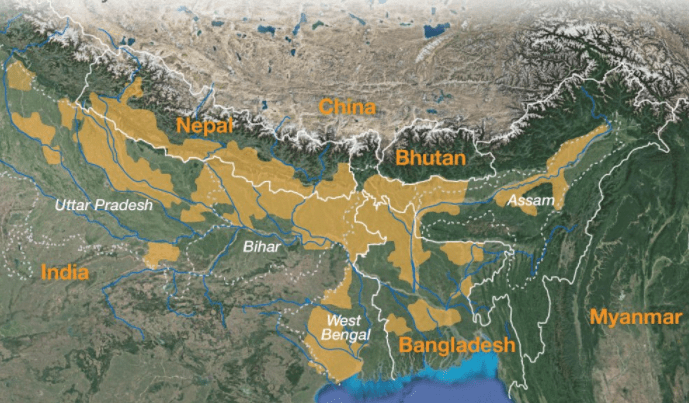 The largest earthquake swarm recorded before this was 3,000 earthquakes in 1985. Jamie Farrell, a research professor at the University of Utah where seismic activity in Yellowstone is monitored, told Newsweek the swarm is “nothing out of the ordinary” and had “slowed down significantly”. The Yellowstone Caldera sits atop a massive magma deposit and is one of the top ten geologic hotspots in the world. A catastrophic eruption would have global implications. Hurricane Jose: Jose has built up into a category four hurricane and is currently looming off the already storm-battered Puerto Rico. When the solar eclipse left the shores of the U.S. and moved out over the Atlantic Ocean, it passed directly over three storm systems meteorologists predicted would not grown into hurricanes: Harvey, Irma, and Jose. Wildfires: There are currently 123 large wildland fires across the nation, burning on about 2 million acres of land. The fires are primarily in the Northwest in Oregon, Washington, Northern and Southern California, and Montana. The National Interagency Fire Center, which coordinates wildland firefighting efforts across the country, is at level five, its highest preparedness level. All of its 25,000 responders are currently active in the field and National Guard troops have been called in to fight the fires. Unusual weather conditions have trapped the smoke, creating dangerous air conditions in some regions.